We can help you to advertise your website on Google from our Panaji – Goa based office. Advertising a website on google has lots of advantages and a well organised advertisement campaign can really boos visitors to your website. Google Advertisements are displayed in yellow color at the top and right corner of the google search results. The Pay Per Click Method of google charges you whenever a visitor clicks on the your advertisement in google and visits your website. Google provides automatic fraud detection and other measures so that you are not charged inappropriately. We provide services to assist you in placing your advertisements on google. Depending on your products / website, every advertisement campaign requires different planning and hence you might need the help of website designers who can suggest the best way to advertise on google. In order to contact us please do give us a call or visit our Panaji (Goa) based office and we can design an appropriate advertisement campaign for you. Payments for Google Advertisements can be made in prepaid or postpaid manners. You can even decide whether how much you want to spend on the google advertisement campaign on a per day basis. The Google Adwords is the product name for placing advertisements on google search results. In case any other website apart from google is displaying google advertisements, we can even setup your website’s advertisements on that specific website. 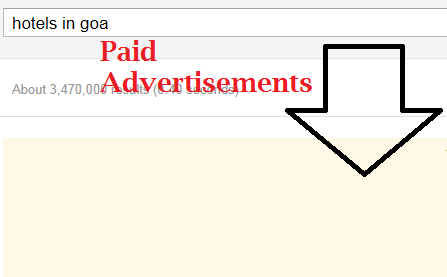 Advertising costs on other websites which accept google advertisements is many times lower as compared to the advertising costs on google itself. When paying for every visitor to your website, you might be interested in a report which tells how many visitors , visited your website using the paid results, what keywords they were searching for, from which geographical location do visitors came and lots more. We can help you to maximize the revenue and achieve better google advertisement results for your website and in turn your products or services. Visit our Goa based office in Panaji or give us a call to get your google advertisement campaign started as soon as possible.